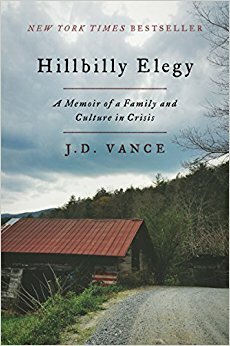 Though released in June 2016, it wasn’t until after President Trump was elected in November that I started hearing about Hillbilly Elegy and saw J.D. Vance on a few panels of “experts” ready to lend an explanation as to why the reality TV show host just won the highest seat in the nation. Big thinkers and retired politicians and angry, biased journalists all had their partial answers – that people weren’t ready for a female president, that Comey botched it, that Americans are a bunch of racist, bigoted, Islamophobic rednecks who have no clue about anything – but J.D. seemed to have the biggest missing piece to the puzzle. The 2016 presidential race was about class and culture, which is something J.D. Vance reflected on after writing what became a pivotal book in understanding what went awry. He grew up running between the holler in Eastern Kentucky, where his grandparents were from, and Middletown, Ohio, where he spent most of his childhood. Prominent jobs in his family included factory work, mining, and poverty. Rooted in Appalachian values – hard work and family gossip is family business – J.D.’s childhood checks all the boxes for reasons why he should not be successful. Addicted mother, absent biological father, rotating door of stepfathers, generational alcoholism, generational poverty, and generational childbirth out of wedlock – all of these issues plague the lower class demographic where J.D. grew up, and while his Mamaw and Papaw weren’t pictures of perfection, they where part of the support system he needed to build a life outside of the holler. He enlisted in the Marines, obtained a bachelor’s degree from Ohio State, and graduated from Yale Law when there was every reason none of those accomplishments should’ve occurred. There are several reasons Hillbilly Elegy is a compelling and important read for 2017. First, if you are interested in politics on any level, Democrat, Republican, or otherwise, this book will shed light on one of the reasons Trump won. This demographic has a long history of voting Democratic, a loyalty that extends from the New Deal and to putting the first black president in the White House. But after years of feeling left behind, ignored, and – worse – insulted by its own party, they jumped ship. They were done. Politicians and voters need to understand that. Second, if you have any interest whatsoever in helping people climb out of poverty, read this book. Your efforts to legislate class and culture will not work, and J.D. Vance explains why. Safety-net state and federal programs are important and necessary to a degree, but the false notion that our federal government is responsible for our livelihood, progress, and success is a lie we cannot continue to believe. More than ever I am convinced the backbone of a strong society is the family, however that family is defined. For J.D., it was his grandparents, sister, and a select number of aunts and uncles. For others, it could be the family they choose. Whatever your tribe, you need your people and your people need you. Finally, if this demographic is part of your heritage, as it is mine, I encourage you to embrace it if only to understand it. I didn’t grow up in the holler, but I spent summers and holidays visiting the holler in West Virginia and I wouldn’t trade those memories for the world. 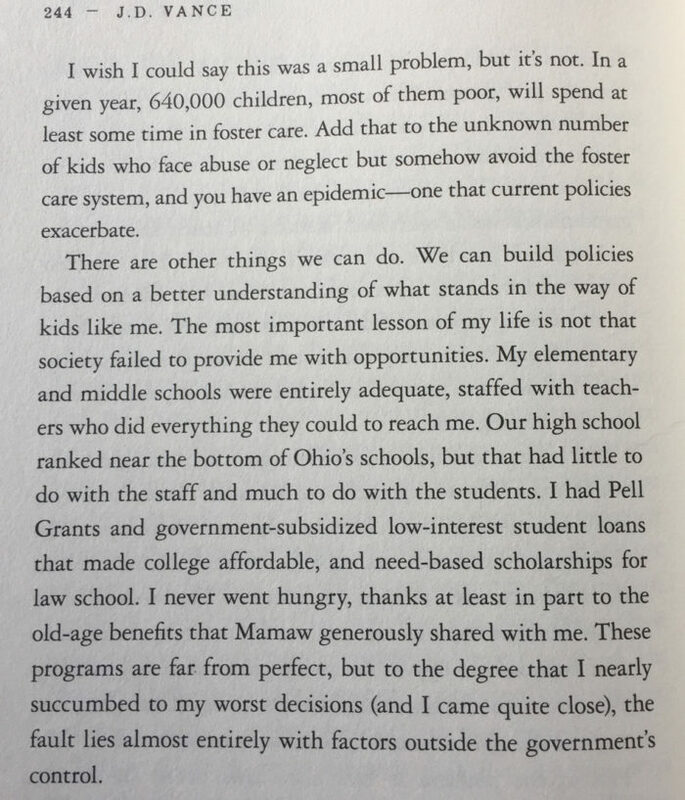 Hillbilly Elegy explains something I already knew – that goodness and honor exists no matter one’s income or geography or family make-up. Love and loyalty are a powerful elixir, a truth that runs deep in the people of Appalachia. Hillbilly Elegy is a quick read, and while J.D. doesn’t have all the answers to the problems that plague our country, he provides a reliable, mature voice for a demographic that helped shift our country to a new, unchartered course. It deserves our attention.